Family-based day care workers can be powerful allies in the state’s battle to curb childhood obesity by influencing diets and physical activities, says new research from the University of Connecticut. Childhood obesity has emerged as one of the most serious and widespread health threats in the United States. Nationally, 17 percent of children ages 2 to 19 (about 1 in 6) are overweight or obese, according to the Centers for Disease Control and Prevention. The obesity problem is particularly acute among Hispanic children. In Connecticut, for example, 16.7 percent of Hispanic children ages 2 to 5 participating in the Women, Infants and Children (WIC) program were overweight and 18 percent were obese, compared to non-Hispanic black children (13.6 percent overweight, 14.2 percent obese) or non-Hispanic white children (14.5 percent overweight, 13.5 percent obese), according to 2011 data. Obese children are at increased risk for a host of mental and physical health problems, from depression to heart disease, and they face shorter life expectancies. Public-health experts have long sought ways to address the issue through schools and health care providers and the federal Let’s Move! program to promote more healthful lifestyles among young people. Child care providers offer “an important opportunity to address childhood obesity” since many children spend more time in child care than other settings, except home, the study notes. Family-based day care centers can help develop good eating habits by offering healthy snacks, such as fruit. Kim Gans, a professor in the department of Human Development and Family Studies at the University of Connecticut, and colleagues from Brown University, the Rhode Island Department of Health, and the University of Rhode Island, ran four focus groups with a total of 30 family child care providers (referred to in the study as FCCPs), asking them about policies regarding meals, snacks, and physical activity they maintain in their home-based day care centers. All of the FCCPs were female Hispanics. Among the study’s chief findings is that the family child care providers “really consider themselves to be part of the family” of each of the children they care for, Gans notes. That finding comports with research results published in the Journal of Nutrition Education and Behavior in 2013 that looked at the home child care setting’s role in shaping young children’s eating and physical activity habits. Dr. Marjorie S. Rosenthal of the Yale School of Medicine, Department of Pediatrics, and colleagues interviewed 17 Connecticut FCCPs of various ethnic and racial backgrounds about the challenges and opportunities they faced in fostering environments that encourage children to engage in healthful eating and activities. The research revealed three core strategies FCCPs use to improve children’s diets and levels of physical activity. The strategies included working directly with the children to improve behaviors in the day care setting; engaging and educating parents about state and federal nutrition and activity standards that need to be met; and taking advantage of the leverage provided by licensing, training, community-based services, and other programs to effect change without ruffling parents’ feathers. Gans says that while the UConn study looked only at FCCPs in Rhode Island, its findings—from the ways cultural mores shape food choices to the need to accommodate parents’ approaches to diet and activity—likely translate to Connecticut, where home child care demographics and settings are similar to those in the neighboring state. Indeed, Jessica Sager, co-founder and executive director of the New Haven-based nonprofit organization All My Kin, which trains and supports community child care providers throughout Connecticut, says the study’s findings “resonate with what we see in our work,” particularly in “the commitment that the family-based child care providers have to promoting good nutrition and physical activity among the children they care for. They see themselves as playing a central role in that. “They understand that the practices they establish around physical activity and eating are clearly going to shape children’s experience in life,” Sager says. Gans says her study adds to the body of evidence that FCCPs who come from cultures in which historically children don’t get enough food tend to overfeed children. “So even if kids are not hungry, we found in this study that providers would encourage eating, even spoon-feeding” children, Gans says. 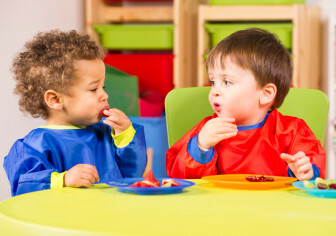 Despite the tendency toward over-feeding, which also may be linked to cultural perceptions that heavier children are healthier than thinner ones, Gans says, “Overall I think the meals providers offer are pretty healthy, featuring rice and beans, vegetables and fruit, not the chicken nuggets and hot dogs” that are more commonly served by non-Hispanic FCCPs. Sager notes that about two-thirds of the providers working with All Our Kin are Hispanic, adding that there is “great diversity” within that umbrella term. That diversity makes her hesitant to paint with a broad brush, as a Peruvian provider and a Mexican provider may hew to different dietary and physical-activity traditions. The study unearthed some conflict between FCCPs and parents, Gans notes, though not “across the board.” In some instances, providers reported that parents send their children to day care with tablets, Nintendos, and other hand-held electronics, implicitly undermining guidelines regarding “screen time.” FCCPs further noted that some parents request their children not play outside when it’s cold—which they defined as 50 degrees or lower. Gans adds that the research found that “sometimes parents didn’t have time to prepare breakfast, and the child arrives at day care with doughnuts,” undermining nutrition standards. The research’s findings will inform efforts to devise interventions that capitalize on the key role FCCPs can play in reducing childhood obesity, limiting kids’ screen time, and improving children’s access to appropriate (and age-appropriate) physical activity and to nutritionally sound foods.